It is investigated that 5,520 colleges, universities, or other higher educational institutional are known as public school over 50 states and other areas in US. In addition, we've analyzed average tuition, other expenses, and financial aids amount. 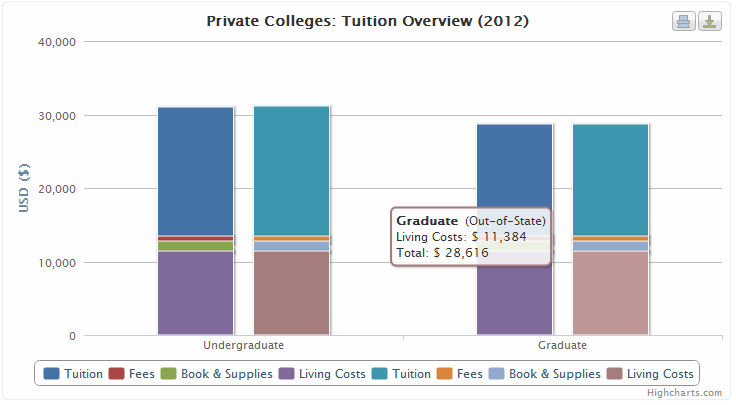 Following table and chart show the overview of private college tuition and other expenses in 2012. If you consider one of private school in your future, comparing tuition and financial aids between them might be a good way to make right decision. You can see various statistics charts and tables of public colleges at private college statistics page.